Involving the crewmember in classroom training geared toward small-unit (squad) leadership and practical fieldwork in fire suppression. 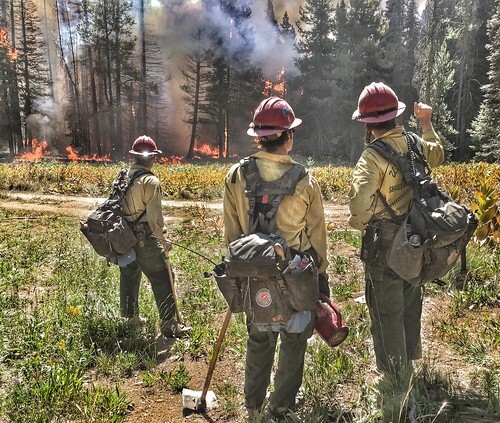 Offering the employee a well balanced, on the ground training experience while providing a highly organized, Type 1 Interagency Hotshot Crew for wildland fire assignments. Providing crewmembers opportunities to become independent module leaders through supervising a squad of 3-7 crewmembers during fire suppression, prescribed fire and other emergency incidents. Developing the employee's instructional skills through intense classroom instruction time in front of their peers. The structure of the Redding crew enables individual crewmembers to supervise a Type 1 hotshot crew in the role appropriate to their development (e.g. Squad Leader, Crew Boss, Task Force/Strike Team Leader, or Type 4/5 Incident Commander). This provides an opportunity to observe and evaluate various levels of performance among peers and to understand crew production. This increases self-confidence and leadership abilities, important qualities with which crewmembers return to their home units. This enhances career progression to greater responsibilities.